Getting in: Do your best to make it past the delicious wafting scent of french fries and burgers, as you must walk into the Bleecker St Five Guys, go past the tables, the condiment stand, and the burger ordering station and make your way to the back staircase. Vibe/layout: This impossible-to-find-unless-you’re-looking-for-it cocktail bar is hidden above a Five Guys, and features two massive vaulted skylights, a glass chandelier, several couches and vintage hourglasses. In addition, The Garret has a sunken private party room decked out with a taxidermied rhino head and copper ceilings. 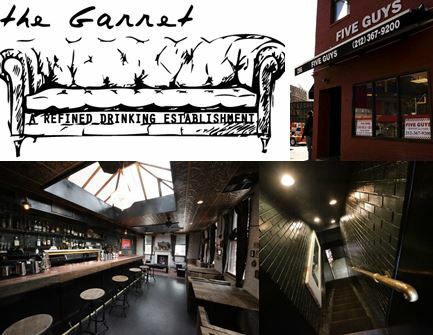 The best part about The Garret…besides the cocktails and the fact that you can snag a burger at literally any time: the pop-in breeziness…no reservations are needed. Drinks: Signature cocktails are made from fresh ingredients right before your eyes, but we highly recommend the Sunken Santa (rum, pineapple, velvet falernum, St. Elizabeth allspice dram, angostura) ($14). F.Y.I. : This speakeasy proudly displays the artwork of NYC based artists, including Bradley Theodore (the swans and skull paintings), Nick Bakita (the rhino head), Philip Mortillaro (the door) and Nathan Driver (painting). ‘Straunt tip: Grab dinner at Jeffrey’s Grocery and then grab a drink here!